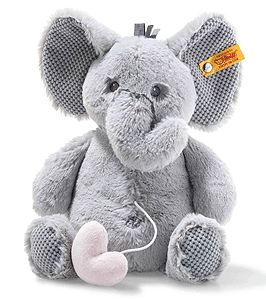 Steiff Ellie Elephant Music Box is hand made in the finest light grey cuddly soft plush. Season launch: Autumn 2018 All textiles in the Steiff Baby toys and gifts range are tested for no harmful substances and certified by the standard Oko-Tex Standard 100 for child safety. The Soft Cuddly Friends Ellie elephant music box is 26 cm tall. When you pull her little heart, which is fastened to her tummy by a cord, the built-in music box starts to play. Then every baby can drift off to sweet dreams with the melody to "Weißt du, wie viel Sternlein stehen?" ("Do You Know How Many Stars There Are?" a popular German lullaby). The music box cannot be removed. Ellie elephant has a short tail. Bean bags have been sewn into her bottom, feet and soles. Her eyes are lovingly embroidered in grey. Her inner ears, soles and feet feature a pretty material mix. Her forehead has a funny little fringe of hair.